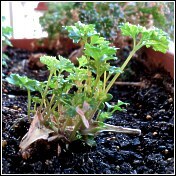 Parsley plants seem to last longer in pots than in the ground; however, they all eventually go to seed. Usually that's the time to bin them, but there is life in the old plant yet. While the leaves are still green, cut the main stem about an inch above the soil with secateurs, then continue to water as before. In a few days, small shoots will spring from the old wood, and soon enough you'll have a revived parsley plant that should last as long as its former self did. You've seen the TV chefs choppity-chopping stuff on a board with a huge knife. It looks impressive, and maybe it's necessary in their opinion, but for my money I don't see the point if there's an easier way. With this in mind, we bought a gizmo like a mini-mincer for cutting parsley and even that was a pain. One day I was in a rush. I pinched some sprigs off the parsley plant and took them to the kitchen. Then it was onto the cutting board, gather up the leaf-heads in the fingers of one hand and a quick slice across with a sharp knife until the bunch was reduced to a pile of parsley bits. I didn't bin the mincer because it cost good money, but I won't bother using it for parsley in future! It sounds easy, and it is; but it can also be very dangerous. Firstly, always use a knife that is big enough to do the job so that multiple cuts to get through the thickness are unnecessary. Pumpkin has a tough skin and the knife used must be up to the job. And, of course, keep your knives clean and sharp. When tackling items that are rounded, after peeling, slice off a portion to produce a flat side. Turn this onto the cutting surface and continue slicing, cubing, etc as desired. Onions in particular can roll and slip while being cut. Unless you really want perfect rings, cut the onion in half, turn onto the flat side, then slice. Remember: half rings are better than half a finger! Always buy whole lettuce and cabbage - not those cut in half. Take off any outside leaves that are damaged or on the turn, then put the head in a plastic bag. Exclude the air, secure the opening with a twist-tie and place in the vegetable drawer at the bottom of the fridge. Unless you need the lot in one go, don't cut or shred - this will reduce the life-span of whatever's left: simply take enough leaves from the outside, then replace the remaining lettuce or cabbage in the bag and refrigerate as before. Kept like this, both can last up to a month. When you don't need a whole onion, place what's left in a glass jar with a dessert-spoon of cold water, screw on the cap and refrigerate. This will keep for at least a week and won't taint the fridge. Unused portions of other prepared, uncooked vegetables like potatoes, pumpkin and carrots can be kept similarly. Odour is not an issue, so plastic containers can be used, but the contents will need to be covered with water and they should be used sooner.